Senator Conroy told The Sun-Herald that internet advocacy groups such as GetUp! were "deliberately misleading" the Australian public about the scheme, which will refuse classification to illegal and socially unacceptable web pages. The legislation, which was expected to be passed before Parliament rises in June, has been delayed until the second half of the year while the government fine-tunes it. The government's $128.8 million Cyber Safety policy includes forcing internet service providers to block access to a secret blacklist of website pages identified as "refused classification" by the Australian police. Web pages will be nominated for blacklisting by Australian internet users who come across illegal or "unacceptable" websites. "This is a policy that will be going ahead," Senator Conroy said. "We are still consulting on the final details of the scheme. But this policy has been approved by 85 per cent of Australian internet service providers, who have said they would welcome the filter, including Telstra, Optus, iPrimus and iinet." Figures from the Australian Bureau of Statistics show that 72 per cent of Australian households have home internet access and more than 2 million children regularly use computers. The scheme has attracted broad opposition from communications experts, search-engine companies Google and Yahoo!, the federal opposition and members of the nation's intellectual elite. Critics claim the policy will not result in any meaningful dent in the availability of harmful internet content, will create significant freedom-of-speech issues and will be prone to abuse by politicians. "The scope of filtered content is so broad that it could block content that would inform political and social debate," Google spokeswoman Lucinda Barlow said. Former opposition leader Malcolm Turnbull has also condemned the proposed filtering scheme as a "white elephant". "This system will not be effective," Mr Turnbull said. "This policy will run the risk of false impressions [of security], when there should be parental responsibility." Executive director of GetUp! Brett Solomon said the Prime Minister should step in to ditch the scheme. "The government would be better off developing policies to ensure the privacy of Australians is better safeguarded rather than pursuing the filter. This should be a promise that Kevin Rudd should break." GetUp! national director Simon Sheikh said a online petition by the activists had received support from 120,000 people and raised $100,000 to stop the legislation. An additional opinion poll by research firm Galaxy showed 86 per cent felt that parents, not the government, should have the primary responsibility for protecting information on the internet. "Consistently the Australian people are saying that they don't want it," Mr Sheikh said. But Bernadette McMenamin of the child protection group Child Wise said it was 100 per cent behind filtering illegal material. "Sites are going to be blocked that should be blocked, and it's absolutely essential every parent is taught about the dangers of the internet." The Australian Privacy Foundation, however, said the cost of the filter would be better directed to more internet education. Yet Senator Conroy said "blocking material is not considered to be censorship". "This filter is really not changing much, except that the blacklist of website pages will be mandatory." The fourth Cyber Security Awareness Week starts next week to help raise awareness of internet privacy issues. Why do people use the term "Photoshop" ? It really erks me when I hear the term "Oh did you Photoshop that?" but what they really mean is that you have altered an image (from original) using some software to do something that wasn't in the original image. Now do a search with your favorite search engine and see what comes up… Now apart from a lot of links pointing you to pirate versions available for "FREE"¹ you won't find a direct hit that uses this term! So why is it then this term exists? Simple, its product association! as we all know Photoshop is software from Adobe! Now for those of us that are using Linux, do we use the term "Oh did you GIMP that?" No because we know better! and yes GIMP is available for Windows & Mac and its free! So next time you use the term… "Did you Photoshop that?" just think about the meaning of that term as it really doesn't make much sense! ¹. Most websites that offer so called free versions have the potential to include more than you bargain for, they usually contain viruses! I do not support nor do I encourage such activity, but you have been warned! ³. End of my little rant! So a small win, Just have to wait and see how the price point for FTTH will compare to the current ADSL plans when the information becomes available. SPAM! Did I get your attention ? Well as we are forced daily to deal with unwanted stuff, weather this be Email, catalogues, To the House Holder or even now on Skype! I've recently been getting a lot of request from so called "contacts" wanting to be added, but they have spam in their request (mainly aimed at anatomy enlargement!) In Skype Version 2.1.0.81 you have the option to both block & report as spam, However what happens to those you flag as spam? OK well in the help (when placing a block on somebody) you have a link called Help this doesn't say much to what happens! but at least there is an option. I've also found that on this blog the default Akismet plug-in does a fair job in stopping any spam from making it into your blog comments, but the one thing it doesn't do is prevent "bots" from flooding you with random crap! So I also use re-CAPTCHA now this is a nifty plug-in (in this case WordPress) and it is just the thing for stopping bots dead in there tracks! 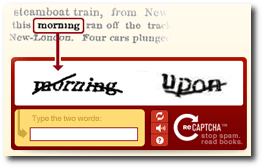 So as you can see, you have to enter two words that are generated at random and also are in an image format so re-CAPTCHA its self is ensuring that it can't be compromised. You can also use this to protect Email addresses as well (as I do on my contact page) So this is how I deal with SPAM pests on my Blog & Skype. Email is another story! as I run my own mail server I use Amavis-New, Spamassassin & ClamAV and this does a very good job of keeping the mail free from spam pests. Actually, the Email side is a double protection as it is both scanning the mail for viruses & spam! and yes I use Linux, so why bother with virus checking? well the way I see it to rid incoming mail of viruses then ensures that they are not spread to infect the target systems they have been written for namely Microsoft Windows!